Posted by Tantumblogo in abdication of duty, asshatery, cultural marxism, disaster, error, foolishness, General Catholic, horror, persecution, Revolution, scandals, secularism, self-serving, sickness, Society, unadulterated evil. Guess who a sodomite activist thinks the wicked are? You got it: you and me. With gay ersatzrimony having the imprimatur of the State, and homosexuality enjoying a positive swing in popular opinion, the only thing standing athwart homosexualism is the Church, which is finding itself increasingly the object of neosexualist agitations. ……….The Equality Act, as it’s called, amends the Civil Rights Act of 1964 by including “sexual orientation and gender identity” (SOGI) as protected classes, equivalent to “race.” The proposed legislation includes protections not just for employment, but for housing, public education, credit, jury service, federal funding, and public accommodations. Despite its noble label, The Equality Act is anything but. By giving special protections to concocted classes of individuals, it abrogates the constitutional freedoms of others, creating inequality. For starters, the bill prohibits appeal to the Religious Freedom Restoration Act as a basis for discriminating against LGBT folk. So if, for example, you are an employee or owner/manager of a private or public business, your constitutional rights to freedom of conscience, speech, and association take the back seat to someone else’s socially constructed “right” to your acceptance of their sexual expression….. The introduction of The Equality Act is a signal that that day is coming. How soon, depends on how the Supreme Court decides the religious liberty case before it, Masterpiece Cakeshop, Ltd. v. Colorado Civil Rights Commission. And when that day comes, churches acquiescing to the neosexualist agenda will be legitimized and officially recognized by the State and allowed to keep their tax exempt status. Churches refusing to comply will lose that exemption, causing many to become financially unsustainable, driving them, the confessing Church, underground. I’m reading a book called When the Wicked Seize a City. It’s about the sodomite political takeover of San Francisco. It was written 25 years ago by an evangelical pastor, one of the few Christians in Sodom by the Bay that actually worked to oppose the sodomite agenda. All the evils, all the tactics, all the means of imposing their will on the majority, were developed, refined, practiced, and implemented decades ago in San Francisco. But Christians were not paying attention, or couldn’t be bothered to care. Too bad. They will make you care. Whether it’s you, or your son or daughter, they are coming for you. These are deeply wounded people who have an infinite need for not just acceptance, but unending affirmation, even glorification, and ending in total obeisance. They will not stop until you are on your knees, practically worshiping them. But in the book, which side was always kind, patient, prayerful, and giving? And which side tried several times to murder the evangelical pastor, set fire to his house, attacked his children, constantly vandalized his home and church, and engaged in shout downs and even more physical forms of intimidation on a constant basis? You got it. The “good” guys. Sodomites are one of the extremes of the Left, and the Left has convinced itself that everything it does, no matter how heinous, no matter how evil, is good by definition. There are no limits to the extremes, to the utter depravity to which people so convinced will sink. This movement must either be crushed, or they will crush us. Is it time to split this country up? Posted by Tantumblogo in awesomeness, Basics, catachesis, Domestic Church, episcopate, family, General Catholic, Glory, Grace, manhood, sanctity, Society, Spiritual Warfare, the struggle for the Church, Tradition, true leadership, Virtue. 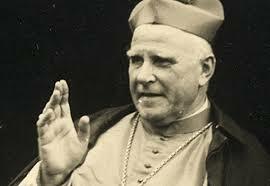 Clemens von Galen was beatified as a confessor, for the witness of the Faith, and defense of his flock, he gave during the rise and fall of the evil Nazi regime. The Nazis, as the Left has been doing in this country for a few decades, attempted to kill the Faith by a thousand cuts. 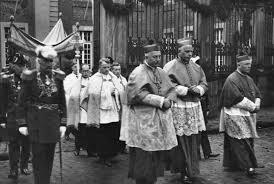 Contra the communists, they simply didn’t outlaw the Church on day one and declare all faithful, and especially clergy, enemies of the state. They operated more by craft, deception, and moderate, but constant application of many means just short of force (though having recourse to force more and more as their ends became more and more obvious – the destruction of the Church – and more and more individuals rose up to oppose them. As we all know, Vatican Council II did not burst on the Church from a vacuum. The rot, pointed out by Pope St. Pius X already 30 years before von Galen, was already quite deep. As such, there were huge debates in the German hierarchy as to how to respond to the Nazi regime. 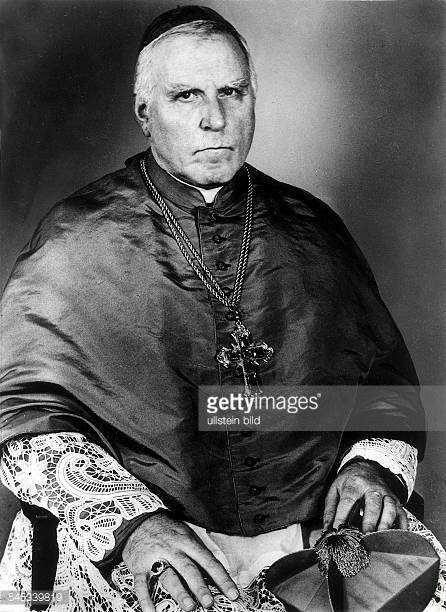 The slight majority of bishops favored general public science and acquiescence, seeking to influence the regime by endless private dialogue behind the scenes, while a large minority, led in part by von Galen, favored a much more public, confrontational approach. Because all the bishops, including for a time von Galen, were convinced they could only have effect if they spoke in total unanimity, all the bishops were kept more or less silent for a time by the ineffectual dialogue faction. Eventually as the persecution became more and more severe, von Galen and others broke with the demand for unanimity and began operating more and more on their own. Nowhere was the persecution of the Church more apparent than in the area of education. Like everything else Church-related in crazy Germany, the Catholic schools were state funded. Well, that gave the Nazis a perfect opening to do just what they pleased with them. Then they simply started closing all the parochial schools and forcing kids into government Hitler Youth indoctrination camps (remember, the modern public school system and structure is a largely German, and progressive, invention). This gave rise to von Galen writing an extensive pastoral letter to his flock on the right nature of Catholic education, to try to give them arms with which to protect their children. It’s really quite good – so good, I can imagine virtually no American prelate uttering words of even close to the same effect. Maybe Burke, but even that’s dubious in part. The point of this post is: compare von Galen’s description of a proper Catholic school and education, and compare to the Catholic schools you know. See how they line up. A Catholic confessional school, according to von Galen, is a school in which Catholic children are taught by believing Catholic teachers, in accordance with the principles of the Catholic Church. [Already we see a massive variance with today’s “Catholic” schools – many children aren’t Catholic, the teachers often are not Catholic and many reject vast swaths of the Faith even if they are, and they are more and more rarely taught according to Catholic Truth.] Religion influences every aspect of education………. He urged parents not to be fooled by the different names that might be used in the propaganda for the new state schools, whether it be “the community school,” “the German school,” or “the German confessional school.” Demand instead: the Catholic confessional school. Then he gave clear, simple, straightforward answers to the standard arguments in favor of the new community schools. Perhaps, he said, parents would be told that in Catholic areas, everything would remain the same in the new schools. “That is not true,” was the response. “If all were to remain the same, then why all the pressure and advertising for a new school? Will all remain the same if teachers can be assigned to your schools who are not Catholic, or who have left the Catholic Church, or who deny the articles of her faith?“………. [But it’s not all on bad Catholic schools……]……No school could make up for parents’ neglect in their children’s religious education. They should be sure to keep good religious writings in the home and to watch carefully the teaching their children received in the school. ………God had given [parents] a sacred responsibility, he told fathers and mothers, a responsibility for which they were consecrated by the Sacrament of Matrimony. The great importance of this Sacrament was becoming even more clear in their own days. Neither the Church nor the state could absolve them of their duty as educators of their children, nor could the schools take responsibility from them. 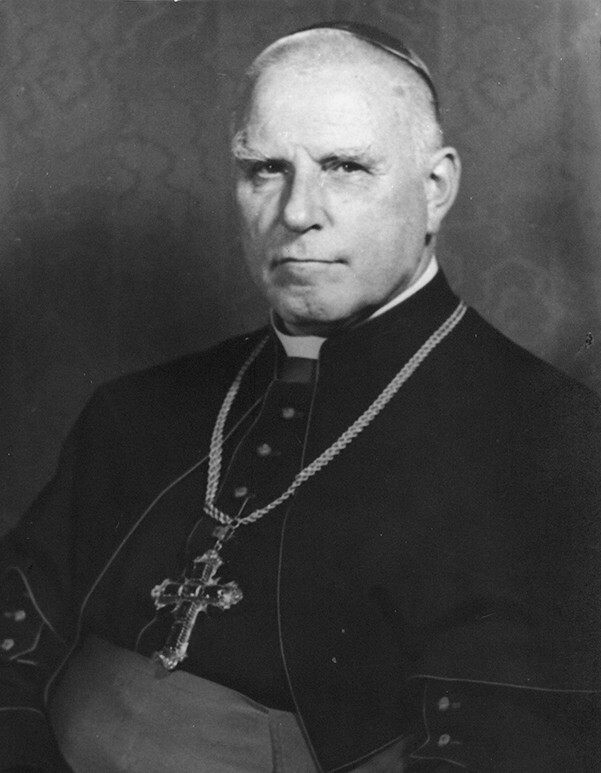 He urged them to recall the words of St. Peter: “He who has an office, let him fulfill it in the strength hat God supplies” (I Pet iv:11)……..
Well, as I said, simply compare and contrast what passes for Catholic education these days in virtually all diocesan or religious-run schools, with what Blessed Clemens von Galen describes as both good and bad in proper formation of children. No wonder, as Venerable Fulton Sheen and many others have said, the absolute last place you want to send your child for Catholic education is a Catholic school (or college/university, for that matter). Yes, there are a handful of exceptions, but even those exceptions carry with them certain dangers. Posted by Tantumblogo in Abortion, contraception, cultural marxism, Dallas Diocese, error, fightback, foolishness, General Catholic, horror, It's all about the $$$, paganism, secularism, self-serving, sexual depravity, sickness, Society. Sorry for the late notice, but my work has had me busier than a 10 point buck on opening day. Nevertheless, Planned Murderhood is hosting one of its booze-soaked fundraisers at a swank Dallas locale. Some folks are coming up from Waco to protest it. Please consider joining them, if you are able. Planned Parenthood is being honored at a fundraiser this Thursday in Dallas — so let’s join some people coming up from Waco to picket the event and shine the light of truth on their abortion business. Bring your own signs, or there should likely be signs you can borrow. Can you imagine, supporting baby slaughter for convenience being your charity of choice? The elites have killed God in their hearts, but satan just filled up those empty spaces with a reprobate sense. Posted by Tantumblogo in awesomeness, Dallas Diocese, Domestic Church, family, Four Last Things, General Catholic, Glory, Grace, Latin Mass, priests, Restoration, sanctity, Spiritual Warfare, the struggle for the Church, Tradition, true leadership, Victory, Virtue. I would like to thank my wife and reader skeinster for sharing this with me. The mother of Fr. Joseph Portzer, FSSP, Teresa Mary Portzer (nee passed to her eternal reward recently. She was a sister of 11, 3 of whom were nuns, mother of 14, grandmother of 71, and great-grandmother of 39 (she outdid my father-in-law, who is “merely” grandfather of 66 and about 24 or 5 great grandchildren). “The cloth (manutergium) in which the hands of the priest is bound is traditionally kept by the priest and is given to the priest’s mother. And the tradition is, then, when the mother of the priest dies that linen cloth, in which her son’s hands were bound when he was ordained a priest, is placed in her coffin. So that when she stands before Almighty God on her judgment day, she will have that cloth in her hands, so that she may say to Jesus Christ, that “Whatever sins I may have committed in my frailty, and whatever evil I have done, I gave the Church a priest.” And that gift of her son to the priesthood will be to her eternal glory in heaven. In addition, the father of the priest receives the stole from the first Confession, for similar reasons. Teresa Mary Portzer, 84, died in her home on Saturday, October 14, 2017 after a long illness. She was one of the founding member of Queen of the Holy Rosary Parish, Vienna, Ohio, where her Requiem Mass will be held. She is survived by her husband of 61 years, Arthur and by her children, Stephen, Paula Meluch, Joan Lipka, Elaine Borneman, Marie Price, Charles, Christine Easterday, Annette Prox, Edward, Gregory, Father Joseph Portzer, FSSP, Regina Aronica, Barbara Criste and Ronald; 71 grandchildren and 39 great-grandchildren; sisters, Elizabeth, Sister Mary, CDP, Sister Mary Providence, CDP and her brother, Bernard. She was preceded in death by her parents, Charles Joseph Kriley and Catherine Josepha (Kuhn) Kriley; grandchildren, Andrew and Francisco Meluch and Christopher Michael Aronica; her sisters, Margaret, Cecilia Geibel and Sister Sylvester, CDP and by her brothers, Anthony, Charles, Francis and Wendelin. The Requiem was held this morning. Father Portzer, formerly parochial vicar at Mater Dei FSSP parish in Irving, TX, offered the Mass at Queen of the Holy Rosary FSSP parish in Vienna, OH. Please pray for the repose of the soul of Teresa Mary Portzer. Families like hers are the rocks upon which the human element of the Church is built.